Let’s begin at the beginning. The story of Peruvian Ron Millonario distillery starts in the year 1904, when the Hacienda Agricola de Chiclayo was founded. New beginnings can be tough though and it wasn’t until the 1950’s that the Ron Millionario flavour and brand truly flourished under the conduction of Augusto Piera de Castillo. The Rum picked up its name due to its exclusivity and asking price – everybody craved it, but only “los millonarios” could afford it. When Fabio Rossi landed in Peru in 2004, he probably didn’t realize he would stumble upon a bigger national treasure than Machu Picchu. He liked the Ron Millonario so much he acquired the brand together with his brother. All we can say is, Mr. Rossi has great taste. Uncle Flaviar, critics and fans all agree – this is a damn fine Rum! The secret to their success? A combination of specific climate conditions, traditional craftsmanship, quality ingredients and a secret recipe of the Piera de Castillo family. Oh, yeah – nowadays you don’t even have to be a millionaire to afford it. Sweet. Sweet is the feeling and sweet is the taste. 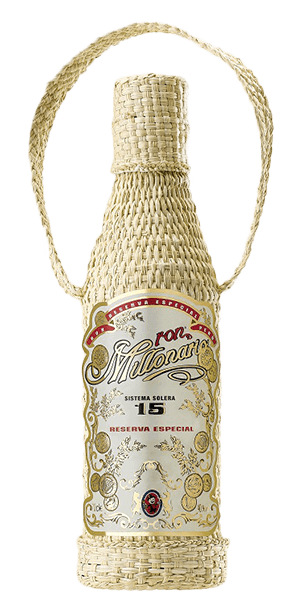 Ron Millonario Solera 15 is a good place to start your Ron Millonario adventure. The sense of excellence and integrity is evident in everything the company does– starting with the woven-covered packaging. It’s what’s on the inside that really counts though and this premium product is gonna knock you of your feet, we guarantee it. The Rum itself is a blend of 8-15 year old Rums, aged in barrels made from American and Slavonian oak, blended through a 4 stage solera process. The final product is a rich, balanced, full-flavoured spirit that won a tremendous amount of awards through the years, among which is also the no.1 Rum in the world at the Rum Masters. But empty praise is a waste, you make up your mind – give it a taste. What does Ron Millonario Sistema Solera 15 Reserva taste like? The Flavor Spiral™ shows the most common flavors that you'll taste in Ron Millonario Sistema Solera 15 Reserva and gives you a chance to have a taste of it before actually tasting it. Nose: Dates. Sultanas. But really, dates. I keep coming back to those dried dates with a good amount of crystallized sugar in them. It's a lovely nose. A little hint of brandy underneath. Palate: The dates aren't as prevalent on the palate. Instead, I'm getting other dried fruits. Some molasses. Palm sugar. It's a nice palate, but not quite as enticing as the nose. Finish: Back to the dates and date sugar again. This finish lingers for quite a while. The date sugar is on my tongue, while my mouth gets some of the dried fruit. Second later, the date sugar is still there. Really a nice finish. Wow this was amazing. Great dessert rum, thick, sweet Carmel flavor with a hint of coffee. Not overly sweet compared to the flavor description. I thought this would be super sweet. Not the best rum I've ever had but still really good though. Starts with a puffhint of brandy. Leaves you with a smooth long lasting sweet taste that reminds you to take another sip. Highly addictive. Very smooth. Too sweet for my taste. My new favorite rum! Great flavors and complexity. One of my favorites: super sweet light-bodied candied rum. Long, pleasant fruity finish. Not heavy or syrupy at all, great to have. Really good rhum with a good sigar. Perfect product for pairing. This was a fantastic sweet rum that tested extremely well with CAO and Gurkha cigars. Immediately tried to find a full bottle to purchase, had to wishlist when I (not surprisingly) found none were available. Wow! Sweet, smooth and easy to drink! This is unquestionably one of the tastiest rums I've ever had. It's like a super smooth and super drinkable version of Pomero Aniversario. This might unseat Gosling's Old Rum as my favorite. the wife and i love this one. she described it as "It's like drinking liquid gourmet French Toast"
Very enjoyable, somewhat sweeter than I was expecting, but the flavor is fantastic. I could sip on this rum all day long. Amazingly mild rum. Sweet and lingering aftertaste. Very good. Something this over the top almost defies description, like the world's tallest building. It doesn't care. It's like drinking every dessert I ever loved at once, and the only downside to me is I had to bring it in from the UK. This is almost like rum and maple syrup, really yummy. We added a bit more water to it to cut the sweetness. It paired well with a lemon cake my wife made for the NYS Fair competition. Perfect pairing. Maybe she will win a blue ribbon.